Nostalgia comes to mind whenever anyone mentions Constructor, a humorous team-based construction game released during the late 1990s on PC. Aside from SimCity, it was one of my most played city planners of the time. I’ve heard little of it since then, so it came to a surprise when I was approached for an appointment at E3 to check out an HD port of Constructor for the Nintendo Switch. 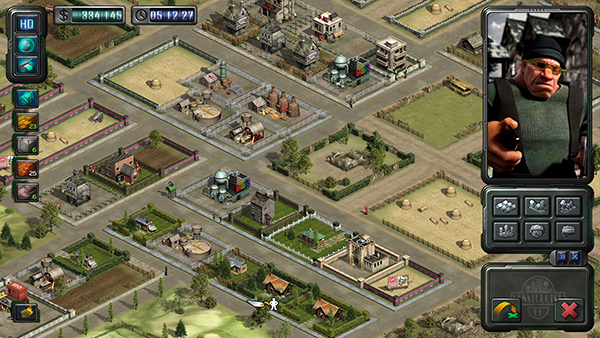 For the uninitiated, Constructor revolved around raising a successful city while dealing with rival factions set on making your life miserable. All’s not lost, though. You could employ a variety of not at all ordinary people to help you balance the game in your favor, such as thugs, hippies, and even clowns, who could terrorize and do away with anyone getting in the way of your megalomaniac planning. Constructor was already pretty complex back when it was originally released, with plenty of different systems running simultaneously. Even with mouse controls, it proved to be pretty busy, so I was naturally a little worried about the transition to a controller interface. The good news is that the game seems to have crossed that gap pretty well. It’s also worth noting that the graphics look really sharp in this remake, even though the characters sometimes seem a bit too small to make out in the middle of all the action going on on the portable screen. Still, it warmed my nostalgic heart to see everything running in such a brisk pace, retaining much of the charm from the original exaggerated character designs. I felt a little overwhelmed by all the details that work in tandem during the game — it was the last day of a very busy E3, after all — so the demo experience proved to be quite informative, as well as shocking, especially considering the fact I was able to deal with all those details back in the day without batting an eye as a thirteen year old. It was also fun to reminisce about my time with the first version of Constructor with System 3’s John Twiddy, who directed both the old version and the remake, and who also just happened to have programmed one of my favorite NES games growing up, tough-as-nails Ikari Warriors. Certainly an unexpected treat. Although originally slated as a Nintendo Switch launch lineup title, Constructor has been pushed back and is now due sometime later this year.